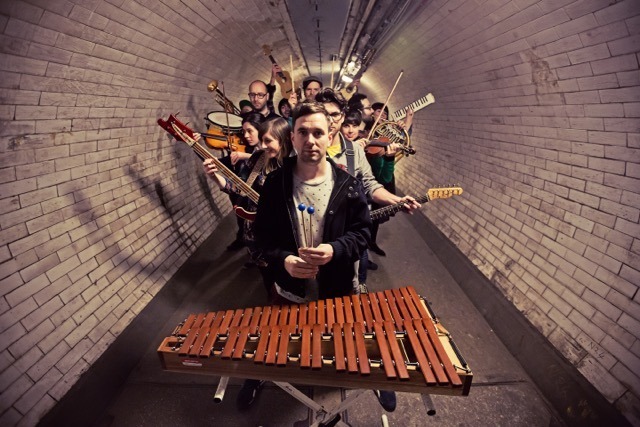 A sort of 16 piece post-rock orchestra led by inspired Scottish composer Paul Russell of instrumental group Axes, Human Pyramids will be releasing their second album Home on 10th November supported by Creative Scotland. Today they have shared a video for new single ‘Crackle Pop’. Directed by award-winning UK filmmaker John Lynch, the ‘Crackle Pop’ music video is an immersive 360-degree experience that pairs the explosive orchestral soundscapes of Paul Russell and the perceptual phenomenon of synesthesia. The visuals that accompany the music were devised through interviews with people who experience visual and spatial reactions to sound and music, a form of synesthesia known as ‘chromesthesia’. The Synesthetes were played the individual instrument stems of the recorded track and asked to describe what they saw or experienced. The visuals were then created based on those descriptions and composited into a 360 degree world with the rest of the band and Paul conducting like some sort of musical wizard controlling it all. The music video will also form a large part of a larger immersive 360 documentary about synesthesia that will be released at a future date.